The Bailey Park in North Carolina is a charming local park which is a popular venue for concerts and public events. Each day in Bailey Park is filled with some sort of event or activity, making it the perfect place to visit for all those new to the Winston Salem area. Expanding across 1.6 acres, this little green area transforms into something fantastic with every passing day. Some highlights to visiting Bailey Park in South Carolina include the free wifi that is available to all who frequent the park. There are food trucks readily available at this park in the Food Truck Court, and restroom facilities in the area. A stage is available for events held in the park, and there is a large expanse of green grass that can be utilized for recreational purposes. Pets are allowed within the park, and on-street parking is free. Apart from attending the amazing events or concerts held in this area, there are plenty of things to do while visiting Bailey Park. Many enjoy lounging on the green grass or picnicking on the grounds. Bicycling, skating, and skateboarding is allowed within Bailey Park as well. If you’re interested in attending any events held within the park, you’re certain to have a fantastic time. The type of event can range from music festivals to cinematic showings: there is hardly ever a day when there aren’t any food-related activities within Bailey Park. With Ice-cream Tuesdays and a variety of food trucks readily available, your visit to this park is not likely to be unappetizing. More information on events held within Bailey Park can be found here. Located near the Wake Forest School of Medicine, the Bailey Park in South Carolina is open from 7 a.m. to dusk daily. 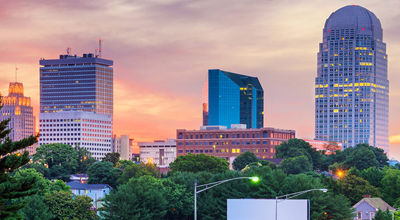 This park is also located nearby The Hawthorne Inn & Conference Center, making this inn the ideal place to stay while exploring the city of Winston Salem, South Carolina. The Hawthorne Inn & Conference Center offers impressive guest amenities and friendly staffing and can be reached from Bailey Park simply by heading north on Patterson Avenue, followed by a left on Fifth Street East. After this, make a left onto Marshall Street North, and the inn will be located on your right. While visiting Bailey Park, enjoy your stay at The Hawthorne Inn & Conference Center. Located conveniently within 5 minutes of the hotel, The Hawthorne Inn & Conference center offers the best rates when you book directly at: www.hawthorneinn.com.